Christmas Art Adoption | Go, Art! We've mentioned before that Josh Scheuerman is one of our favorite SLC residents. It makes sense, then, that we would merrily plug his efforts in any way we can. 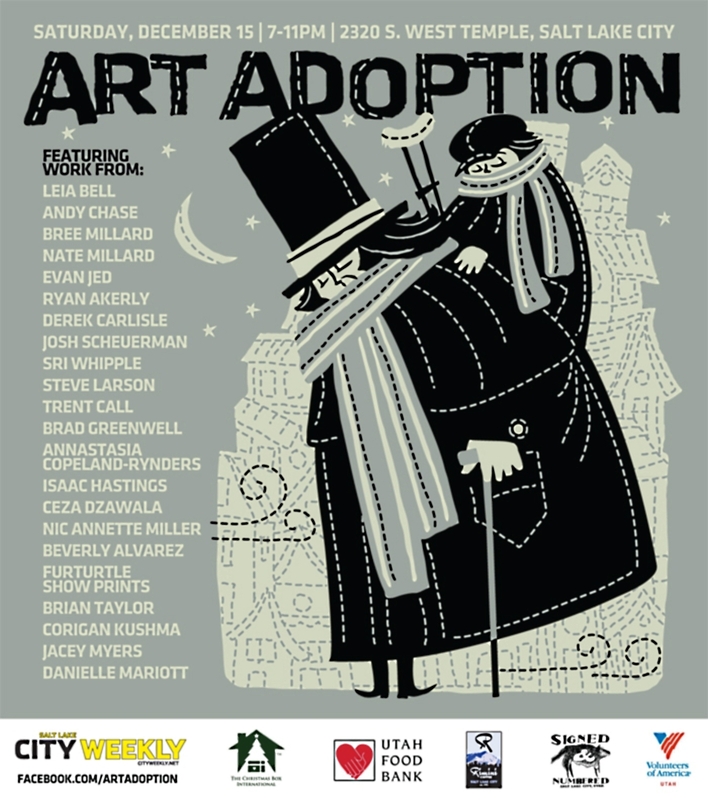 Another Art Adoption is upon us, and we strongly suggest you take advantage of it, folks. Strongly. In Josh's words, "I wanted to create a welcoming atmosphere where our community can mingle, have a good time, get all sorts of social, and return the fruits of our [the artists'] labors." Well said, we say. Artists that will be represented include Sri Whipple, Leia Bell, Danielle Marriott, Corigan Kushma [one of the COLLECTIVE's newest members! ], Nic Annette Miller, Señor Scheuerman himself, and a load of others. Any peeps in attendance are encouraged to bring non-perishable foods and new/used clothing, which will be donated to the Utah Food Bank and Volunteers of America Youth Resource Center, respectively. Additionally, any donations for beverages at the bar will be a charitable donation to The Christmas Box House, so drink up and get loose with your wallet. Adopt neglected art, support local artists, consume free wine/beer, give back to your community, socialize with crystal cool people, and knock off the remainder of your Christmas gift list. Six birds, one local stone.